When I was a boy, my parents were avid square dancers, members of The Promenaders in Kenmore, N.Y. They owned square dance finery. Mom had skirts with multiple petticoats and Dad had silver points on his collars, and bolo ties, and pearly buttons on Western shirts. They danced on the weekend and for the rest of the week Dad would hum any of the catchier tunes he’d learned. I remember one that went “Hoop-dee-doo!” I heard that a lot. In the summer, they would travel to Massachusetts to a square dance camp in the Berkshires. This was not my brother’s scene; he went to Salamanca for the week to be with our cousins. I went to Camp Becket. In the back seat of the car, I rode with the square dance clothing which hung in an extra-wide, quilted hanger bag that held it all. I was a small boy, and I just fit, with room for a book and a PEZ dispenser. The conference was held at Camp Becket on Rudd’s Pond, a YMCA camp for the summer, and home to hundreds of square dancers the last week of the summer. The Berkshires were beautiful. I loved that part of the ride, the narrow roads, the hills and trees, a small stone chapel out in the middle of nowhere, and then the gates of Camp Becket. I loved Camp Becket. With our friends the Starks, we stayed in a cabin up the hill from the dining hall. Mike Stark was a square dance caller; his wife Betty was a physical education teacher at the University of Buffalo, a lovely woman. They had two children, Linda and Mickey. Each cabin had a front door, a back window, and side windows with big wood shutters that swung open to air the cabin and closed to keep out the rain. Two wood bunks, four beds on each side. I slept in an upper bunk, which I thought was an adventure. A bed sheet and clothes lines hung in the middle, creating a screen between the two families. A few cabins up was the latrine, called “the automat” for reasons I cannot fathom. The grown-ups had dance classes in the afternoon, learning new dances and new steps, and formal dances in the evening in their finery. Before my mother went square dancing, she would put on a harness that held large pads under her armpits to soak up and hide any perspiration, and keep both her blouse and her dignity unstained. Sometimes we would watch from the balcony, the shifting patterns of the squares so clear from overhead, the swirling skirts like pinwheels. It was like every night was Saturday night. People were happy. I remember a caller named Jim Brower with a beautiful, deep voice, who sang his calls and turned every dance into a musical. In singing calls, the cues to the dancers were threaded throughout the song, all in the flow. It was real artistry. I remember one popular dance called “Birdy in the Cage” with a dancer or couple “caged” by the other dancers before they flew out and went home. There was always something special going on, like the hat contest. The theme one year was “Poor Boy,” a song that had the lyric, “They call me poor boy, poor boy, poor boy. But I ain’t lonesome and I ain’t blue. Because I could never be a poor boy, as long as I have a dolly like you.” My father’s hat was a toilet seat, and he had hopes of winning. But then in came a man wearing, on his head, a cage made of twigs, and inside, a live mouse. Stole the show. My father was suddenly a bitter also-ran, wearing a toilet seat on his head. The staff at Camp Becket was made up of college students, and when you are 10 years old, college students seem so grown up, so totally cool. One of the most memorable was the captain of the Harvard University Track Team. He was a black man, which was a novelty of its own in that era; you did not see many people of color while square dancing in the Berkshires. He was tall and athletic, and very funny, and when he ran through the woods, hurdling tree trunks, appearing one moment and disappearing the next, our jaws dropped. He seemed faster than the breeze that was ruffling the leaves. He was not alone in his coolness. A zen bodybuilder, blonde, tanned, muscular, spoke softly and had a picture of another bodybuilder taped over the door of his cabin with the penciled caption, “The body is the temple of the mind.” A scholarly young man reverently played classical music in his room, selecting from a long row of records in green cardboard sleeves. “This is Bach,” he would say. A young woman taught us how to make lanyards with red and white boondoggle (which she called “crab wire”), and boxes with popsicle sticks and white glue. I remember the Longley’s, who headed the youth program. They had a son gifted with great energy and an imagination that bordered on demonic. He once gave his mother a piece of some wild radish that inflamed her throat. They had a daughter who was a year or two older than me; I had a crush on her. She was so pretty, and found me pretty annoying. There was a scandal when Mr. Longley initiated a game of spin-the-bottle as an activity. The kids thought it was great, but the leader heard a lot of grumbling from adults who suggested that, with such laxity, the teens would soon be spawning like salmon. I remember the morning we did the Hokey Pokey on the dance floor of the main lodge. This was the first place I put my “left foot in.” And of course, we square danced. I am sure I could still allemande with my left hand, do-sa-do, swing my partner, go forward & back, and take my partner’s hands in the correct position to promenade. One year, there was a trip to a mountain to go hiking, a long climb up a riverbed with huge boulders, a mountain view that was so beautiful I thought of jumping off and ending it all right there, going out in a rush of beauty, and never having to go home again. My best friend each summer was Jon Kier, who came with his parents from Sharon, Massachusetts. We related to one another. I enjoyed his company. Seeing him for the first time each summer was such a rush. We’d been apart for 51 weeks, and it felt like 5 minutes. And he had a little sister, Debbie, who was angelically beautiful. During a life-and-death moment in a Capture the Flag game, deep in enemy territory, I left Debbie standing alone in a bog while I sprinted to freedom. She said it was fine for me to go, but I still feel guilty. Capture the Flag was one of the highlights of the week. The border was the 50-yard line of the football field, and the “jail” for each side’s captured players (who awaited a liberator bold enough to sprint in from out of the woods or from across the 50-yard line and tag them free) was the end zone, but the game sprawled from there, with the 50-yard line stretching into the woods as far as you cared to go, and the flag’s “secret location” anywhere on your side of the line. The flag could be a mile away, but it had to be in plain view. Usually you just had to look for the players guarding the flag. Once you found the flag, you had to find a way to grab it without being captured first, and then you had to make your way back, outrunning a forest full of opponents who were calling in the hounds of Hell upon you. It was joy. One team hung their flag on a clothesline on the back of a cabin about a half a mile from the football field. They had a man on either side of it, scanning the woods like Secret Service personnel, forgetting that the cabin had a back window, which suddenly flew open, a hand reaching out and disappearing with the flag, the pounding of sneaker soles on the cabin floor and the game was afoot. I remember some passing adults applauding the lad’s audacity. Nobody was too big or too small to play. If the game ended too soon, we played again. I have no idea if my team ever won or lost; I just loved the thrill of it all. During meals in the dining hall, the staff members would shout out jokes, one person shouting the first half from one side of the room, and another replying from the other side, and then everyone laughing. I remember two: “Hey, Bob,” a staffer shouted, “they just opened a hotel with no bathrooms!” And the reply, “Why Ed, that’s absolutely uncanny.” Someone, certainly not either of my parents, explained that “the can” was slang for the bathroom, and then I laughed. The other was easier to get, “Hey, did you hear about the new restaurant on the moon?” “No, what’s it like?” “Great food, but no atmosphere!” All these jokes could have used rim-shots, but they weren’t necessary. The rafters were emblazoned with mottos: Manners Maketh The Man; Each for All, All for Each; Help the Other Fellow; Play the Game. One night at dinner, I sat with a man who had been on a submarine in the U.S. Navy. I was an eager audience for war stories; he told me about a time they were going to sea for 30 days, and on the third day, the cook informed the crew that due to a snafu, all they had left was ham with raisin sauce. They ate it three times a day for 27 days. This story was prompted by the evening’s entree, ham with raisin sauce, which the man pushed away, having had his lifetime supply. During dinner, I would watch people. I remember a young woman, blonde, muscular, who every day swam the lake with someone accompanying her in a rowboat. She was training for some distance event. I think she was from Buffalo, and had come to Camp Becket with her father. Every time I looked at her, she was quiet, not speaking, serious. Her swimming was in earnest. Another person on the fringe was a young man with a name something like Jim Lingo or Longo who rolled the cuffs of his short-sleeve shirts, combed his dark oiled hair a lot and smoked Viceroys while posing. He neither swam nor square danced, and I couldn’t understand what he was doing at Camp Becket. He probably wondered as well. After dinner, someone would play the piano and everyone would sing. I learned dozens of verses to “Mountain Dew” and “My Darling Clementine.” And sometimes, if asked, the pianist and a banjo player and a bass player would do “12th Street Rag,” and sweat would pour off their foreheads. I was spellbound. The lake was my favorite place. At least once each summer, we would hike around the 90-acre pond, following a trail that bordered the shore. The woods were beautiful. As the years passed, I grew to know every turn, every glen, every pathway, every tree root, and the lean-to halfway around. The library, on the upper floor of the boathouse, was wonderful. Every book was old, boy’s adventures from the 1920’s and 30’s, and they all smelled like summer camp. Becket was the only place I ever read Zane Grey. I loved Polar Bear Club, swimming at dawn with mist rising off the water. Some men would dive in, get out, soap up while standing on the dock, and then dive back in to rinse, leaving a trail of bubbles. I know that at least one morning we roused an adult named Scottie to join us; he had promised the day before, and we held him to his word. I think Scottie lived in King-of-Prussia, Pennsylvania, and I thought how cool to live somewhere with a name like that. Surely there were red-coated hussars riding down the main streets. The next day, I swam a mile, but I did not tell him. Linda Stark told him. He sat and wept, and told me to go away. After that, I just sat on the dock. One afternoon, I told “drunk jokes” to older kids; I was a big collector of drunk jokes, mostly from Reader’s Digest, and I got a real lift when I made teenagers laugh. A watermelon smeared with lard substituted for a greased pig one day; I had visions of embracing the melon and surging across the line to victory; I did embrace the melon but it spurned my advance, slipping free, leaving me with a greasy chest and a sinking feeling. One night, the fog descended. If you’ve ever read a British mystery set in fog-shrouded London, you get the idea. I love fog. I think it’s magical. And this fog covered us for days, growing thicker and thicker, until you couldn’t see five feet in front of you. The British philosopher George Berkeley (1685-1753) held that esse est percipi, to be is to be perceived. (Through surrogates, Berkeley gave his name to Berkeley, California, in 1866, and a C in British Philosophy to me in 1967.) Berkeley held that matter did not exist and that if we cease to perceive something, it ceases to exist. Hence, for George Berkeley, Camp Becket ceased to exist because no one could see it. It was very cool. At night you had only your memory of the paths and a flashlight that barely shone to your sneaker toes to guide you. Most evenings, we young people were either put to bed or, when we got older, went out to play flashlight tag. I remember one girl was just hysterical; she put her flashlight into her mouth, clicked it on and her nose glowed. I wish I could remember her name. Short, blonde hair, blue eyes that sparkled even without the flashlight. 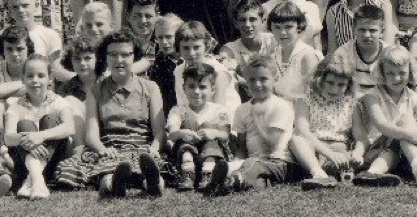 From the group photo in 1956, me with the cuffed jeans, framed by Linda Stark in her square dance skirt and Mickey Stark flexing. I have other memories that don’t fit in, but won’t go away. The group photo, which featured the Model T driven by a round man with a crewcut, who gave rides to the kids. A bowlegged man with a big smile. On the balcony of the lodge, a young man in his twenties saying, “Anita Eckberg!” in worshipful tones. A staff member bursting out of the dining hall and throwing up on the rocks outside, and another staff member coming out moments later with a big silver aluminum pitcher of water, like the one on our table, to wash the vomit off the rocks while I stood frozen with the suddenness of it all. The older boys, who stalked the girls like some exotic prey. They had to work fast; camp only lasted a week. And the young man who boasted of succeeding. I don’t remember much about the last day each summer. Saying goodbye to Jon Kier. Looking at the lake one last time. Packing, getting into the hot car for the long ride home. It’s as if those memories are printed faintly on tissue paper, and maybe I’m just making them up because I know they had to happen. Sadly, no one I knew ever got to say goodbye to the square dance week at Camp Becket. Everyone left thinking it would happen again the next year, and it didn’t. Someone must have known, but for me, it was news over the breakfast table at the beginning of the summer. We aren’t going. They aren’t going to do it anymore. It took me 45 years and Google to find Camp Becket and Jon Kier again. His life has been like mine in some ways, and different in others. But he assures me his little sister is still beautiful. Camp Becket, founded in 1903 by Henry Gibson, is a still a YMCA summer camp. You can visit its website at www.bccymca.org.